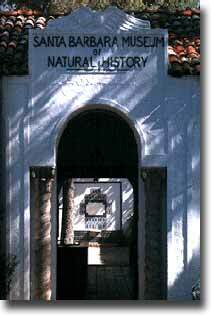 In 1937, Howard loaned the skull to Mr. David Phoenix, a local Laguna Beach Geologist, to take with him to Santa Barbara. Mr. Phoenix was attending a geological seminar there, and he agreed to set aside some time to take it over to the Santa Barbara Natural History Museum for analysis. Dr. David Banks Rogers, the Director of the Museum, inspected the skull and immediately became excited with what he was holding. He recognized it as exactly what the museum had been looking for for many years! He felt it was the "missing link" in a long chain of evidence of prehistoric man on the California coast that the Museum had been carefully gathering. He said it was definitely a specimen of the "Oak Grove People", a type of man that inhabited the California coast long before the present day Indians that were here when the Spanish came along. 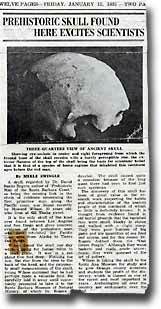 Dr. Banks noted that the shape of the skull, being so small in measurement, with it's barely perceptible rise from the eye sockets upward, and the unusual flatness at the top of the skull so different from that of modern coastal Indians, confirmed Archeologists theory's that these people were short, blocky, and small in stature. The Archeologists had already surmised this from many subtle clues gleaned from archeological excavations. He said that from what they had found, they were poor hunters of big game, and ate great quantities of seafood and acorns...hence the name "Oak Grove". Although the scientists had found remnants of primitive baskets, and rather crudely made arrow points, they appeared to not have any knowledge of the art of pottery making. Now the news of the find hit the newspapers. It became the topic of much conversation within the town of Laguna, and great interest and debate by the archeological community in California. Everyone wanted to get a look at the skull, and Howard was invited to many a meeting in the area to bring the skull for the locals to "ooh and aah" over, and for scientists to puzzle over and ponder. Of course, Grace Wilson still had her doubts about having an old skull in her house, and all the fuss didn't ease her concerns one bit. She had occasionally tossed the skull in the trash after Howard first brought it home. When he would discover it missing, Howard knew what had happened and he would quickly fish it out of the trash can again, and replace it on the shelf in his closet without saying anything about it. He knew it was a sensitive subject with Grace, and he didn't want to make matters any worse. But now - after this public fuss and all - Grace knew she couldn't toss it out again. She finally had come to an understanding with the situation. She may not like the skull being in her house, but since the scientists thought it was important, it could now stay for good. Howard knew it too, and he felt relieved that his prize would not end up in the garbage dump again if he went away for a while!